Graduate Outcomes: The outcomes that all students are required to demonstrate by legislation irrespective of discipline and award type or level. The JCU Model: The attributes of a JCU curriculum intended to shape our graduates’ distinctiveness. Also see: JCU Model Showcase videos. Curriculum Enhancement Priorities: The curriculum priorities that are recognised at JCU and across the higher education sector. Curriculum Design Process: The whole of course curriculum design process. "We are committed to student engagement and success by responding to the student voice, and to working in partnership with our students." 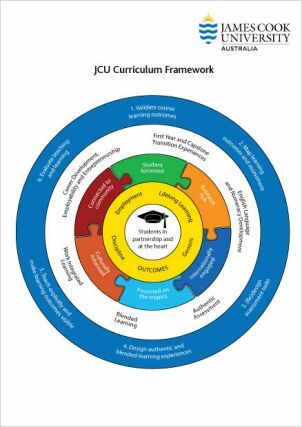 In the JCU Curriculum Framework, the JCU student or employable graduate is our point of focus.